I’m feeling better and have been in Taupo for nearly a week. I’m getting caught up on a few things and figuring out where I’m headed next. It looks to be Wellington at this point where I will crossover on a ferry to the South Island. I hope to have about a month down there with good weather (fingers crossed) before my parents come at the end of next month with Rachel following shortly behind. Despite being sick I still managed to get out and do a few things, including the Tongariro Crossing(! ), all of which can be found below. Oh yes, and I took some nice 360’s while on the Tongariro Crossing so check those out! Tongariro Crossing – With the weather clear, the sun shining, and my cold almost gone I was able to hike on this magnificent trail. The crossing is just south of Taupo in NZ’s oldest national park and is easily accessed by bus. Since the trail is 17km (6-7 hours) one way it’s really the only thing you can do. The trail starts off easy with little uphill and plenty of boardwalks over rougher terrain, which was nice because all I did for the first half hour was stare aimlessly at Mount Ngauruhoe, an active volcano to the south with a near perfect cone. After an hour passed we reached the first rest area with a side track to Soda Springs. I chose to do the sidetrack while everyone else began the rigorous, steep climb up to the first saddle. The ascent is difficult and taunting. You look up to the next ridge, think you are there, and pull yourself up and over it only to find another ridge in your way over and over again. 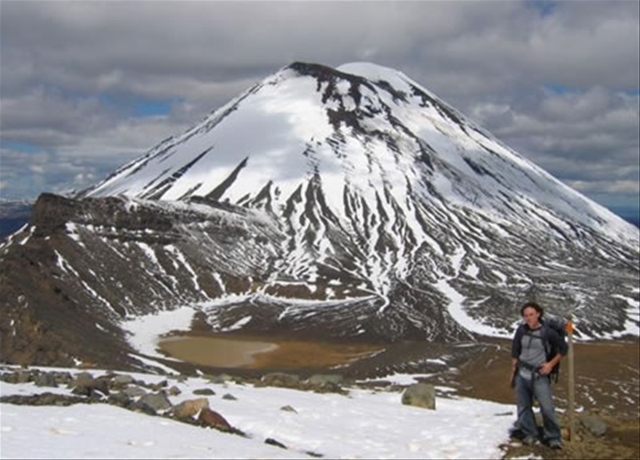 The pain in your legs subsides though once you reach the first saddle that crosses between two active volcanoes, Mount Tongariro and Mount Ngauruhoe, and through the South Crater. It also gives you a chance to take in the scenery and catch your breath until the next, but much smaller, ascent is reached stretching up to Red Crater. Although, the second ascent was less strenuous it did prove too much, or perhaps it was the altitude, for an older gentlemen who decided to project food from his mouth onto a neighboring boulder. From there you reach the highest point on the track, 1886m and have nothing but downhill ahead of you. The view from the top is spectacular as you can clearly see both volcanoes, the deep red in Red Crater with steam rising around its rim, emerald lakes below you, Blue Lake to the north, and Lake Taupo in the distant horizon. And was a nice place to have lunch and snap some photos. On the descent you practically fall over yourself on the lose ground and skid into the 3 emerald lakes below that are actually a group of water filled explosion craters. Once past these you walk through the snow covered Central Crater to Blue Lake where you can look back on the best part of the trail before it fades into the background as you slide around the North Crater, pass by an over night hut, and walk through alpine grass overflowing on to the path before plunging into the native forest and eventually reaching the end of the trail. The Tongariro Crossing was great in that it showed you a little bit of everything New Zealand has to offer. I don’t know if its New Zealand’s “Best One Day Hike” but is definitely one not to be missed. Cheers to Yen, a German Chinese girl that I met on the trail, who took photos of me! Good luck to you on the rest of your around the world travels and I hope you enjoy South America as much as I did. Craters of the Moon – A nice, short loop around a very active thermal area with plenty of steam rising up everywhere and that foul sulfur smell in the air. Huka Falls – A good walk around the teal colored river taking you past a hot river that anyone can freely enter, through native forest, and ending at the falls. The falls were impressive because the river which normally runs 70-100 meters wide is forced into about a 10 meter wide rock channel. The force you feel by standing over the falls on the bridge is incredible and makes for a nice waterfall as it shoots out into a wider body of water. Aratiatia – Taking off where the Huka Huka Falls trail ended the Aratiatia Trail begins. It doesn’t take you through anything epic or unique not found anywhere else in the northland besides what I call ‘dead forest’. But according to a couple I met coming back on the trail they said it was living and the trees were purposely planted too close to each other. This made them grow straighter and faster by reaching up for the sun and of course easier to cut down when the time was right. Anyway, the trail lead to a hydroelectric dam. Normally the water is diverted elsewhere, but four times a day is allowed to freely run its natural course. So from a few vantage points you can watch the dam gates rise to the fall of water which quickly pools up and cascades down the mountainside.